Summer on Ellesmere Island Nunavut a Photographer’s Dream! I just returned from an awesome trip on top of the world! I spend the last month and a half on the top of the world, Ellesmere Island which is located in Nunavut, in Canada’s high Arctic. I was one of a handful of people who was lucky enough to visit Quttinirpaaq National Park this summer where, on assignment for Parks Canada, I photographed wildlife, spectacular landscape and historic sites. I was able to capture images of Muskox, Arctic Wolves, Arctic Foxes, Perry Caribou,arctic hare and lots of nesting birds. It is amazing how this remote island can support so much life. The animals were more curious than afraid of me which is probably because of how few people they encounter. The landscape was spectacular. I photographed glaciers, fjords, rivers and stunning mountain landscapes. I also toured the island by helicopter to access historic sites. One of the sites I photographed was Ft. Conger which hasn’t changed much since the first polar explorers, in 1809, used it as a base camp. Old bed frames, cabins and rusty cans litter the site. I even saw a human scull nearby. In the summer, the sun never sets, it just circles the sky which is a great opportunity for unlimited photographs. I was often up all night photographing wildlife as they passed by. Ellesmere Island is a really special place and offers a unique opportunity for those looking a unique northern photography experience. I spent three weeks at Amherst Island, Ontario, in January of 2014 hoping to catch a snowy owl in flight. The snowy owl is one of my favorite birds. It’s also elusive, therefore hard to spot. Fortunately, I did come across this majestic female perched on a fence post. She was still for over an hour as she waited for her next prey; I waited as long as she, for she was my next subject. Suddenly it happened; she lifted off, flying sideways to catch a vole, and I was able to capture her just as her eyes focused on me. I am very proud to say that this photograph, which I titled ‘Arctic Ghost’, won this year’s Outdoor Photographer Birds in Flightassignment. Spring in Iqaluit means long days, warmer weather and great light! I just received my new canon 600 lens in the mail just in time for spring. I’ve been photographing dog teams on the sea ice and the results are sharp and crisp. I am getting ready for the annual Toonik Tyme Festival, April 11-20. I’ll be shooting most of the outdoor events like skijoring races, traditional dog team races, igloo building and seal skinning and more. Make sure you check my site for new images in April, lots of great photos from Iqaluit’ festival to welcome back the sun. One of my favorite pictures is featured in this month’s National Geographic’s Spotlight, which focuses on what inspires our photography, our processes and the story behind our favourite pictures. The power behind this great gray owl, the intense look on its face and the muscle definition in its wings as it lifted off after catching a vole on the snowy ground, are what make it one of my favourite shots. You can read the entire interview here. The last few months were busy. I spent June and July in the Gaspésie and Côte Nord regions of Quebec, on both sides of the St-Laurence river photographing Northern Gannets, Atlantic Puffins, Common Murres, Bald Eagles, and Osprey. One of my destinations on this photo trip was Bonaventure Island. This island is about a 30-minute boat ride from Percé Quebec on the tip of Gaspe Peninsula. It has one of the largest Northern Gannet colonies in the world and is a prime location for photographing them in flight and in their nesting habitat. On the north shore of the St. Laurence, I visited Longue Pointe de Mingan, near the border of Labrador. The little village is a short boat ride away from a small island called Île aux Perroquets. The island is part of Mingan Archipelago National Park. 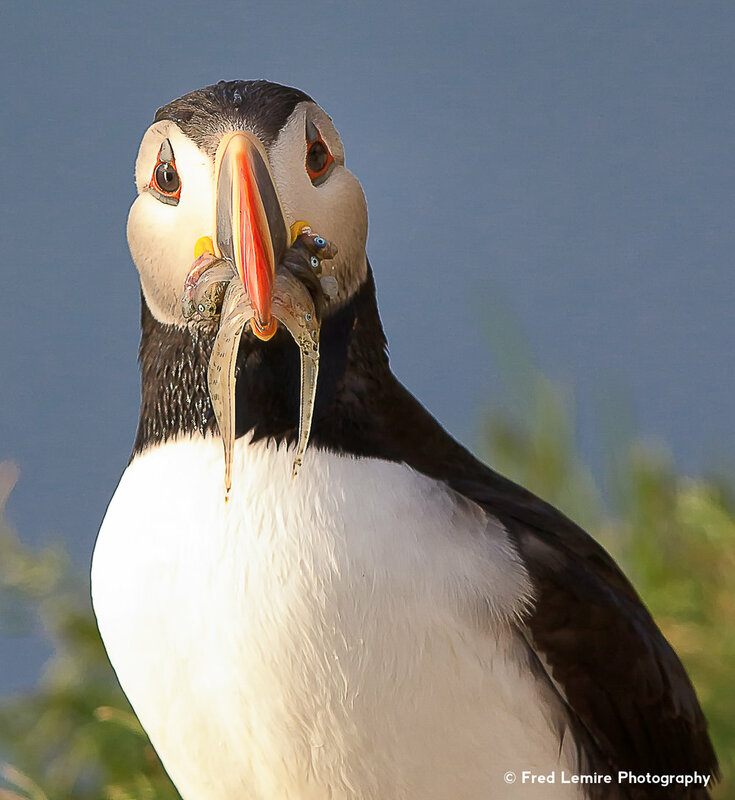 There is an old lighthouse and light house keeper buildings which we can tour, but more importantly it’s a great place to photograph atlantic puffins, common murres, ducks and lots of other sea birds. Check out my bird photo gallery to see some of my new photos. In August I was back in the Arctic. I spend lots of time on the ocean to photograph polar bears in their summer habitat. As a wildlife photographer, I spend many hours, sometimes days in the field waiting to see animals. The territory is vast and the animals are always on the move to find food. I had been searching for bears for two weeks when I finally saw a big female bear swimming from a island to shore. It’s always tricky to photograph from a boat with the waves and wind making the boat unstable. I managed to get some shots of the bear before she disappeared on the land over a hill. Check out my polar bear gallery to see some of the swimming bear photos. I have just enough time to get some prints ready for clients and finish a few other projects before leaving again. This time, it’s to Bella Coola, British Columbia to photograph grizzly bears. I will be guiding a grizzly bear photo safari in the beautiful Bella Coola Valley. The Atnarko river runs through the valley and is one of the best places in Canada to photograph grizzly bears in their natural habitat. In September, when the salmon go up the river to spawn, a large concentration of grizzly bears go there to feed. This is also a good time and place to see wolves and bald eagles.